Each community must be considered on an individual basis in order to tailor the most appropriate range, quantity and quality of recreational Facilities within fiscal limits. The country has experienced rapid socioeconomic and demographic shifts—from a decline of federal grant programs to the explosion in the number of natural resource preservation community action groups. As a result, there is a need for a comprehensive review of the underlying philosophy of park planning. The latest park, recreation, open space and greenway guidelines released last year by the National Recreation and Park Association (NRPA) appear to have been based on a new philosophy, with a "systems approach" to community facility planning at its core. The new approach reconsiders the old notion of a national standard of 10 acres of park land for every 1,000 people, which has been in place since 1981 and is generally recognized as deficient in todays recreation and open space environment. NRPA presents an alternative premise which states that every community has its own unique blend of social and economic characteristics that define it. Each community must be considered on an individual basis in order to tailor the most appropriate range, quantity and quality of recreational facilities within fiscal limits. This article maintains that the traditional method still has an important place in system planning and should be acknowledged alongside the new NRPA position. Most significantly, though, is a fourth change: the establishment of level of service standards (LOS) and the recognition that the residents of each community should be given the right to determine the size and use of land set aside for parks and recreation facilities. Cognizant of such changes, NRPA developed the new guidelines based on the systems approach to facility planning. This approach requires that recreation planners and urban planners work with residents and community groups in an ongoing, dynamic planning process. Past planning models relied less on direct community involvement and more on mediated public hearings with limited technocratic input from staff and consultants. Importantly, the new approach also recognizes that facility planning should constitute a component of a given community's comprehensive land use plan. Most park and urban planners realize that socioeconomic trends will always influence future planning methodologies. The new guidelines specifically address the following. • Environmental Trends: pollution reduction, disappearing resources such as wetlands and forests, and the greenhouse effect. • Social Trends: the importance of wellness activities and desire to maintain diverse cultural heritage. • Economic Trends: reductions in per capita leisure spending and the increasing cost of maintaining public facilities. • Demographic Trends: a declining divorce rate and growth of urban minorities. Illinois park districts will most likely find cumbersome the determination of both supply and demand for specific activities in their community.... consequently, it is unlikely the NRPA LOS methodology will be practiced on a wide scale. The new guidelines reflect the theory that the combination of these trends will profoundly influence parks and recreation systems planning and services in every area of local government. For example, there will be a greater emphasis on cultural resource planning as well as more green spaces that act as part of neighborhood or downtown revitalization. Planners will also seek to attract groups who might usually be limited in expression by cultural or age barriers, thus assisting in the fulfillment of the goals of the new philosophy. The systems approach seeks to achieve more of what the new guidelines refer to as "stakeholder involvement," which may include adopt-a-park projects, park stewardship committees, friends-of-the-park groups and community volunteers. 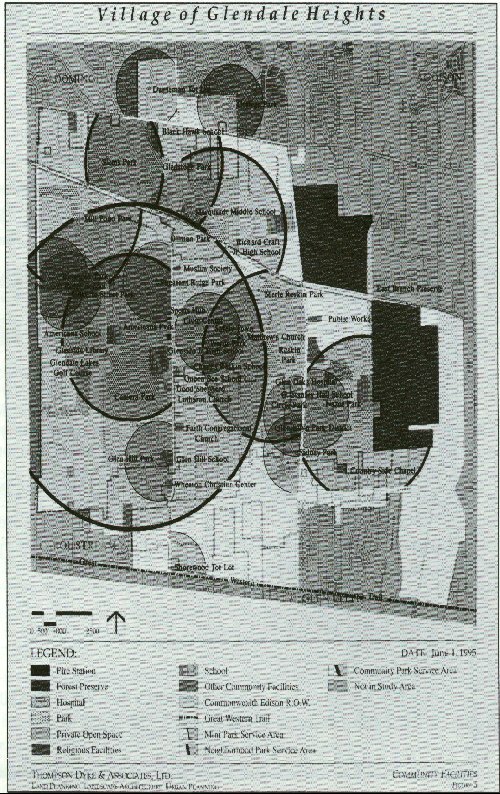 The process itself is essentially comprised of two parts: first, analysis of the physical components (zoning, school district properties, natural resource characteristics, water resources and historic districts); and second, developing the planning framework and LOS guidelines for each individual community. Once the community's infrastructure has been fully considered, the planning framework is designed to determine the Level of Service guideline. The LOS sets the community's standard for a minimum amount of space required to meet the citizen recreation demand. The LOS addresses infrastructure concerns in particular and links the systems approach to the actual planning process. 8. collective LOS for the entire park and recreation system. 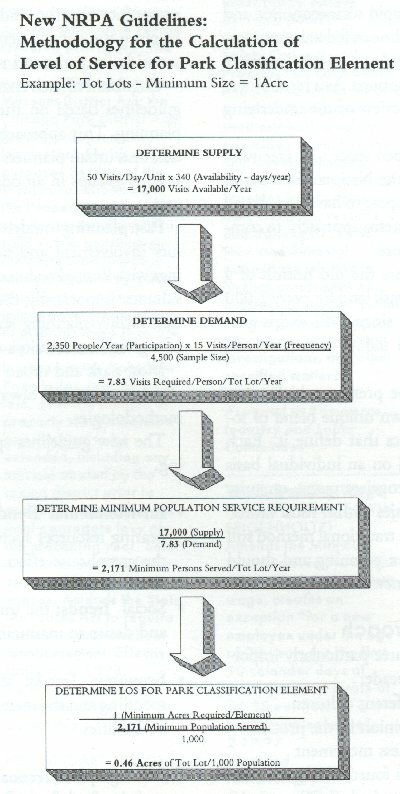 To illustrate the process, a tennis courts supply can be calculated by multiplying its expected use (number of visits per day per unit) by its availability (number of days available per year). The expected use is determined as a combination of average daily use and peak use. Once the supply is determined, planners then determine the number and types of users, from light users (one visit per year) to medium users (one visit per month) to heavy users (one visit per week). The recreation facility demand can then be calculated by adding the products of the three types of users and dividing the total by the number of people in the community. From there, the facility classification can be determined. While the process is a complex, formulaic one, it does represent a fresh perspective on an issue that has not been revisited by NRPA in many years. The new standard is dependent on the specific characteristics of individual communities. Each community should arrive at its own unique facility classification blueprint for recreational planning. The new guidelines recognize the importance and complexity of the processes of land use controls, political review, bargaining, cooperation and citizen group involvement. It is well understood that facility planning should constitute a component of a community's comprehensive land use plan. And, the new method should play a role in revisions and updates to comprehensive plans and planning processes throughout the country. Illinois park districts will most likely find cumbersome the determination of both supply and demand for specific activities in their community. Thus, the chance that precise LOS evaluations will be made is minimal. And, consequently, it is unlikely the NRPA LOS methodology will be practiced on a wide scale. Most practitioners have knowledge of both supply and demand for individual activities and facilities throughout their community. It is park district management's responsibility to adequately assess the need for additional facilities using enrollment, peak demand and demand figures where appropriate. The new guidelines do not suggest abandonment of traditional planning methods. In fact, they build upon previous methods and provide a scientific method for evaluating demand for recreation and park facilities. In Illinois home towns, the planning process should start with the premise that comprehensive land use, political, socioeconomic, long-term public interest and resource availability are the most important factors in providing the background for a successful planning process. An often overlooked component of planning for park districts and departments is coordination of planning efforts with the municipality. Planning ..efforts should occur at all levels and in full communication with other local agencies so synergies can develop and tax dollars can be maximized. The scientific analysis should then be applied with other governing factors against a backdrop of a national standard. It should be accepted that partisan politics and subjectivity will always represent major elements of local democratic decision making but, also, that goals for various planning activities can be best attained if carefully coordinated in a balanced, analytical and comprehensive manner. In the real world of tax cap legislation and strained capital budgets, the planning process provides the mechanism for public involvement and it provides park boards with much needed direction for capital budgeting. Administrative staffs might like the new analysis because it may serve to educate the board and staff as to the many issues associated with forward thinking. However, the traditional methodology could well be deemed to be more appropriate, depending on ones point of view and the resources available to conduct such a highly complex study as that required for the LOS approach. is a senior planner with Thompson Dyke & Associates, established in 1981 and specializing in urban planning, land planning, golf course design, zoning, open space and park. planning, and landscape architecture. TD&A is a consultant to municipalities, private land owners, businesses, private developers, hospitals, park districts, institutions and others who require assistance with land-related Issues. is the president of TD&A, an associate member of the Illinois Association of Park Districts. He also serves on the board of the Glencoe Park District. For more Information, contact TD&A al 847.272.6280 or tda@interaccess.com. Below: Traditional service area analysis has been a useful tool in determining the level of service of parks and recreation facilities, and, also their physical relationship to other community facilities.